Well, after many subtle hints... and quite honestly, some not so subtle My girlfriend and I finally did some shopping and as you can see, the results are outstanding! YAY!!! Lookin good and I'm glad you find some helpful info in my posts and articles Happy and safe riding to the two of you!! By the time she makes the leap to her own bike, and she eventually will, she will have had the license for a while and the course completed. That will mean cheaper insurance for her. The insurance companies want to know how long you've been licensed, not if you've actually ridden. Mrs SB started off as pillion with me about 4 years ago, and after some long trips she (with some prompting from her son and myself) embarked on her own license. Now she rides all over the world! On HER own bike. Be gentle, be kind and share the riding experience. If your lovely lady (and she does make the kit look OUTSTANDING ), wants to ride along side you rather than behind. She will. 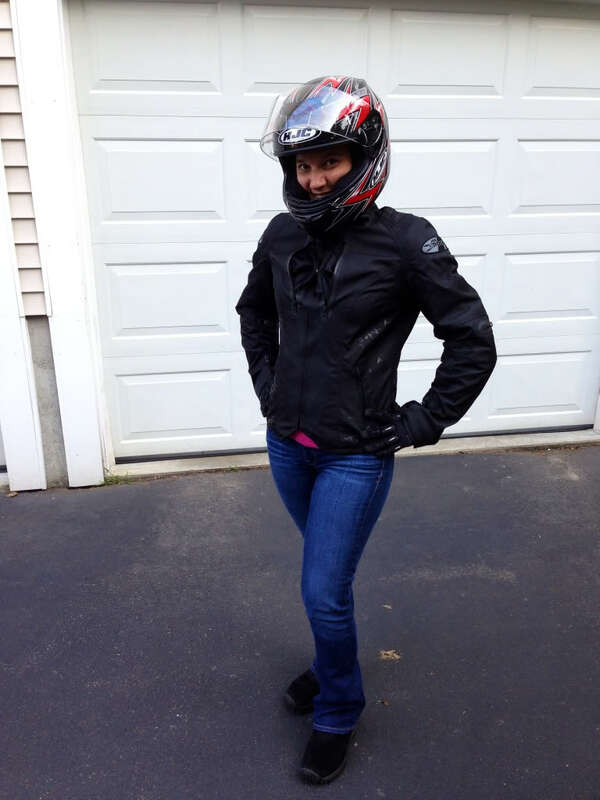 I was just now thinking to get my GF some riding gear so she could ride with me. I totally agree, and it's a good way to get a little "front seat time" for her without having to buy a bike yet! See if there are any sparks! Well put SB! I made sure I let her know my #1 goal (beyond her safety) was for her to enjoy the experience WITH me, not just be a passenger to my enjoyment Oh and I shared this thread link with her specifically so she could know that someone (other than me, who is apparently biased) thought she looked good in her gear! So thanks for the (tastefully stated) back up on that! I kinda wanna surprise her with it, but I think a surprise trip to the gear shop will be better. I was in the same boat! I am a "surprise gifter" by nature, and I wanted to do the same... but I am very glad we went together, becuase I was looking at the "girly" stuff, and it turns out she was leaning more towards the "Bad A$$" look... who knew! Plus I think it added to her security to have one of the guys at the gear shop explain "Helmet 101" to her, and help her get the correct fit. Thanks everyone! I don't normally reply to each individual response to a thread, but like I said, I shared this with her and I wanted you all to know that I appreciate the positive attitude of the members here. It helps alot. Man how did you do it? Lol. Congrats on convincing her to ride with you. Maybe she can talk to my wife and convince her then they can talk about their mutual love for cats. Be safe! Thanks Tele1650! I'd like to take credit for my amazing skill at being convincing, but really I just think she wanted to try it! Although she didn't seem opposed to a long discussion on the topic of cats with your wife, so maybe that's an option! Three thumbs up; for the Two-up riding, the gear, and the girl.